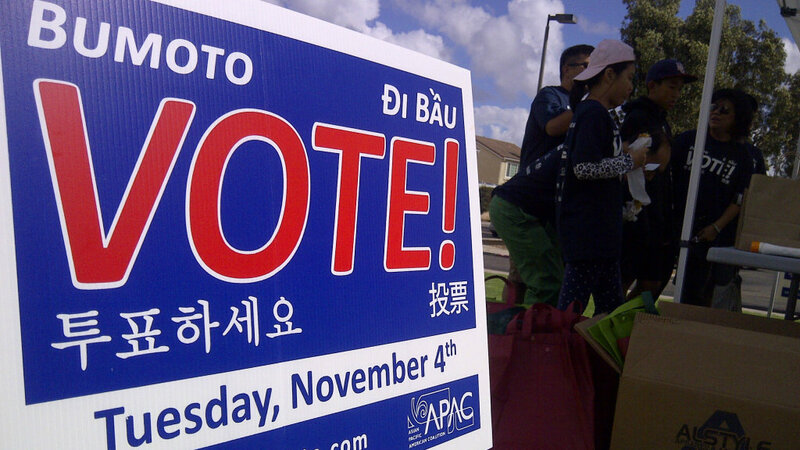 On a cold, stormy Saturday in Mira Mesa, at least 40 volunteers with door hangers and other materials sought to increase the turnout among Asian-American voters in the upcoming election. The so-called Super Walk get-out-the-vote campaign was hosted by the Asian Pacific American Coalition, a nonpartisan civic group. This election is a litmus test of sorts for the Asian community. It is the first election since the redistricting of District 6 into the Asian district in 2011. The city is also on the verge of electing its first Asian-American council member since Tom Hom some 50 years ago, and Todd Gloria, the current council president. Both candidates for District 6, the only contested council race, are of Asian descent. District 6’s population is about 36 percent Asian but only 19 percent or so are registered voters. “It’s important to get the API community involved and get them into the election process and make our voices heard,” Ron Cho said. He hoped that Saturday’s effort made an impact on people and got them to vote, he said. Cho, his wife and their two children went to some 154 houses in the district in about two hours. It was important for his children to take part in the process and hopefully a sense of civic duty will be embedded in them into adulthood, he said. Also at stake is the Democratic majority on the City Council. But that’s not what’s important for these volunteers. They just want to see Asian voters to get to the poll. In last November’s election, only 28 percent of Asian voters cast a ballot. “This is our franchised rights to participate in our democracy and having the right to vote is a precious right that should be applied,” Rudy Bilang said. District 6 covers Mira Mesa, Kearny Mesa and part of Clairemont Mesa and Rancho Peñasquitos.